Danielle and Dougall love working together. Most recently they have taught in Seattle and Palo Alto. Well, get ready – because they are coming together again for a fun weekend opening the psychic senses! Get ready to laugh, learn, open to intuition and grow! Join us for an evening of psychic fun as two of the world’s most respected spiritual teachers, Danielle MacKinnon and Dougall Fraser tell you their journey about working in this unique industry. 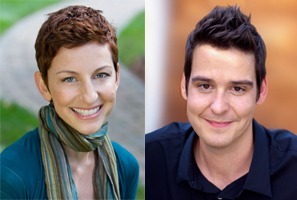 Random participants will receive tandem readings from Danielle and Dougall. Watch how two different styles blend effortlessly bringing accurate and insightful information. Danielle is coming from Boston and Dougall from California! Join us for this rarely held EAST coast event with two renowned experts in the spiritual community, who are very popular speakers! Learn more. A Guide to Fine-Tuning and Perfecting Your Unique Psychic Gifts In this day-long workshop, psychic guides Danielle MacKinnon and Dougall fraser help you take your existing or budding clairvoyance, clairsentience, and more to new heights! You’ll gain insight from two unique teachers while learning how to set your foundation, quiet your mental chatter, access and interpret various types of psychic impressions and more! It’s an interactive day designed to help you gain greater clarity on your own life and of those around you. Danielle and Dougall will also help you practice the grounded steps to manage your intuition. And as an advanced guarantee – (don’t worry, you’ll be ready by the end of class) they will walk you through doing group audience readings! Learn more.